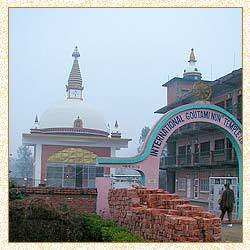 Information on buddhist pilgrimage site of lumbini - the birth place of Gautam Buddha. 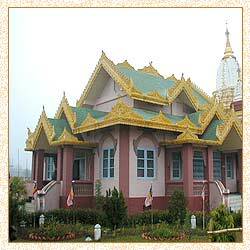 Lumbini is the birthplace of Lord Buddha and located in Kapilvastu district of Nepal. Just before His birth, Bodhisattva was the lord of Tushita deva realm. There He had resolved to be reborn for the last time and show the attainment of enlightenment to the world. He had made five investigations and determined that this southern continent, where men lived for one hundred years, was the most suitable place and. Since the royal caste was the most respected at that point of time and the lineages of King Suddhodana and his Queen Mayadevi were pure, He chose to be born as their son, a prince of the Shakya dynasty. After placing crowning His successor Maitreya, Bodhisattva descended from Tushita to the world of man. The night He was to be conceived, Queen Mayadevi dreamt of a great white elephant entering her womb. The earth trembled six times. It is said that just like all the other bodhisattvas, he remained sitting cross-legged for the whole time in the womb. Furthermore, like all the other Buddhas, he was born under a tree in the forest, while His mother remained standing. At the appointed time, Queen Mayadevi was visiting the Lumbini Garden, approximately ten miles from the Shakya city of Kapilavastu. Emerging from a bath with her face to the east, she leant her right arm on a sala tree. Bodhisattva was then born from her right side and immediately took seven steps, from which lotus flowers sprang up - in each of the four directions. Facing each direction, He proclaimed with a lion's roar, "I am the first, the best of all beings, this is my last birth''. He looked down to predict the defeat of Mara and the benefiting of beings in the lower realms, through the power of His teachings. He then looked up to indicate that the entire world would respect and appreciate his deeds. Lord Brahma and Lord Indra then received him and bathed him, along with the four guardian protectors. At the same time, two nagas, Nanda and Upananda, caused water to cascade over him. Later, a well was found to have formed there, from which monks continued to draw drinking water, even in Fa Hien's time. The young prince was then wrapped in fine muslin and carried with great rejoicing to the king's palace in Kapilavastu. Many auspicious signs accompanied Bodhisattva's birth. Many individuals, who would play a major role in his life, are said to have been born on the same day: these included Yasodhara, his future wife; Chandaka, the groom who would later help him leave the palace; Kanthaka, the horse that would bear him; the future kings Bimbisara of Magadha; Prasenajit of Koshala and his protector Vajrapani. The Bodhi tree is also said to have come up on the day of Buddha's birth. When Ashoka visited Lumbini, two centuries later, his advisor, sage Upagata, described all these events to him, pointing out their sites. Ashoka made many offerings here, built an elaborate stupa and erected a pillar surmounted by a horse capital. By the time Heun Tsang saw it, lightning had already destroyed the pillar. Nevertheless, even till the end of the last century, the inscription on the ruin was sufficiently legible to clearly identify the site as Lumbini. Prince Siddhartha spent the first twenty-nine years of his life in Kapilavastu. There, he performed three more of the twelve principal deeds of a Buddha. Surpassing all the Shakya youths and even his teachers in all fields of learning, skill and sport, he showed that he had already mastered all the worldly arts. One day, while still a child, he was left unattended beneath a tree, as his father performed the ceremonial first ploughing of the season. He sat and engaged in his first meditation, attaining such a degree of absorption that five sages going overhead were brought to a standstill by the sheer power of it. Later, he got married to Yasodhara and experienced a life of pleasure. However, despite King Suddhodana's efforts to protect him from the unpleasant realities of life, one day while riding in his chariot through Kapilavastu, he happened to see a man feeble with age, another struck down with sickness and a corpse. He immediately realized the suffering nature of men's lives. Then he saw a monk of holy countenance and recognized the path he would be taking in his life. It is said that a Buddha renounces the world only after seeing these four signs and after a son has been born to him. Seven days before Siddhartha was to be crowned as his father's heir, a son, Rahula, was born to Yasodhara. Without further delay, Siddhartha told his father of his resolve to leave the transient luxury of worldly life and live as an ascetic, to discover true happiness and aw way to end of misery. Suddhodana was against this decision. Therefore, riding the horse Kanthaka and accompanied by the groom Chandaka, Prince Siddhartha left Kapilavastu. After covering some distance, he got down from the horse and performed the great renunciation. He cut off his hair and donned the robes of an ascetic. Then, he sent Chandaka back to the palace with his jewels and horse, and took to the life of an ascetic. Some years later, after attaining enlightenment, Buddha returned briefly to Kapilavastu at His father's invitation. Lord Buddha and His followers were welcomed by the king and his people, who later listened to His teachings with great reverence. Five hundred Shakya youths became monks at this time, including Rahula, Buddha's own son; Nanda, His half brother and Upali, the barber, who later became one of Buddha's most important disciples. The splendor of Kapilavastu did not last for long, for the rival king Vaidraka destroyed the city and most of the Shakya clan, during Buddha's lifetime only. When the Chinese pilgrims visited the area, they found nothing but ruins and desolation and merely a handful of people and monks dwelling there. However, all the sites of the events mentioned in the early scriptures were pointed out to them. Several of these were still marked by stupas. After this, the area got lost in jungle and till early 21st century, was accessible only by elephant. Presently, only Lumbini, the birthplace of Buddha, has been identified with certainty. Kapilavastu is still tentatively located. Till date, these sites are still being explored and some ruins have been unearthed. One can see the remains of Ashoka's pillar as well as a shrine, of indeterminate age, dedicated to Queen Mayadevi. A Nepalese Buddhist temple was built in 1956 and a Tibetan monastery of the Sakya order was completed in 1975. The monastery, along with a beautiful and elaborate shrine, is well illustrated by the traditional murals. Many young monks are studying here and practicing Buddha's teachings. Thus, they are performing two pious acts, aiding the revival of Lumbini as a place of Buddhist practice and preserving the great traditions lost in Tibet. The Nepalese temple, which is cared for by a monk of the Theravada tradition, also has rest houses within its grounds, provided by Buddhists from Japan and the former U.N. General Secretary, U Thant. In cooperation with the Nepalese Government, UNESCO is also helping to improve and develop this pilgrimage.